A few clouds. Low 47F. Winds WNW at 10 to 15 mph..
A few clouds. Low 47F. Winds WNW at 10 to 15 mph. A steady stream of viewers attends the First Friday Art Walk and Photo Reception at Gallery 'N' Gifts in Tehachapi. The Tehachapi Valley Arts Association offers photo contests for youth and adults, and their photography is displayed at Gallery 'N' Gifts at contest time. The Mill Street Marketplace business owners will be joining in First Friday events beginning Sept. 1. Vendors will include Alligator Rose, Taylor's Provisions, The Coffee Mill and Mill Street Kitchen. Tehachapi Symphony Orchestra Musical Director and Conductor Dr. David Newby conducts a season-opening performance. The BeeKay Theatre is a popular venue for plays and performances. Tehachapi Valley Recreation & Park District staff run the snack bar at a Movies in the Park. They are Morgan Stewart, Corey Torres and Angie Kroeger. Tehachapi is wired for excitement, despite its sleepy mountain town exterior. All year round you can find community events sprinkled throughout the town. Catch a movie at one of Tehachapi’s beautiful parks — Brite Lake, Philip Marx Central Park or Meadowbrook Park — or stroll around Tehachapi’s quaint downtown district on First Fridays. Downtown is chock-full of local artists’ work and artisan goods and places like the BeeKay Theatre keep the spirit of performance art alive in Tehachapi. While the Gran Fondo and the Tehachapi Mountain Festival might draw a larger crowd, there’s enough arts and culture fun year-round that’s just as enticing. Downtown Tehachapi is the spot for visitors on the first Friday of every month. Attendees can get their fill of art during the First Friday Art Walk and artist receptions at historic downtown locales. Other events and local businesses participate interchangeably, so check out the Tehachapi News for details during your visit. If it’s the classics you’re craving, the Tehachapi Symphony Orchestra is sure to satisfy. An award-winning orchestra, it performs a variety of concerts throughout the year at Country Oaks baptist Church, 20915 Schout Road. The nonprofit symphony has been conducted by director David Newby since the 1999-2000 season. It’s fully funded through private donations. For more information, visit tehachapiorchestra.com. The Summit Singers also hold concerts throughout the year. 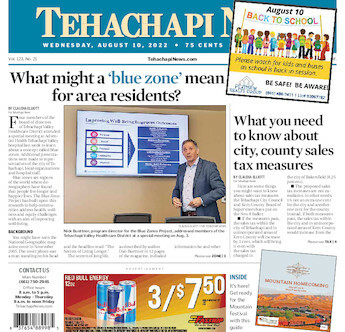 For more information, consult the Tehachapi News. Fiddlers Crossing will satisfy your craving for acoustic, coffee shop music. Fresh-brewed coffee, teas and other goodies are included in the ticket price. Tehachapi News publishes previews of their concerts, so check out the paper or TehachapiNews.com for the latest offerings. The Tehachapi Treasure Trove is your source for tchotchkes, knickknacks and art supplies in Tehachapi. Its treasures include yarn, sewing materials, beads, etc. You can put those supplies to use by attending one of the Tehachapi Treasure Trove’s many classes at 116 E. Tehachapi Blvd. To find a schedule of these classes visit its Facebook page: www.facebook.com/pg/TehachapiTreasureTrove/. Tehachapi Treasure Trove hosts a First Friday Fun Fest on the first Friday of the month. For more information, call 661-822-6794 or vosot tejacja[otreasiretrove.com. The BeeKay Theatre, 110 S. Green St., is Tehachapi’s first neon-lighted building. It was built in 1932 and restored in 2008. The theater hosts the Playwright’s Festival every July, where playwrights, both nationally and internationally, can submit unproduced work, in April, for a chance to win the title of Playwright of the Year. The theater is run by the Tehachapi Community Theatre organization, a nonprofit, which puts on a variety of live shows throughout the year. The stomping ground for all things acoustic, Fiddlers Crossing, 206 E. F St., is your Tehachapi source for unplugged-style music in a coffee shop atmosphere. It hosts a plethora of events year round, but is always open on Wednesdays for open mic night, 7 to 10 p.m. It’s also open on First Friday for an open house of entertainment, coffee and tea. Fiddlers Crossing hosts a variety of music styles: traditional and contemporary folk, bluegrass, singer-songwriter, Americana, country, western, blues, Celtic, world and others. Call 661-823-9994 or visit fiddlerscrossing.org for more information. Gallery ‘N’ Gifts is the Tehachapi Valley Arts Association’s co-op, which sells a multitude of fine decor in the front of the store and hosts eclectic artwork, available for purchase, in its gallery in the back of the store. Gallery ‘N’ Gifts sells a variety of products like: hand-poured scented candles, hand-sewn quilts, pottery, luxurious bath and body products, beaded and precious metal jewelry and woodwork to name a few. It’s on 100 W. Tehachapi Blvd., at Green Street and Tehachapi Boulevard, and open seven days a week from 10 a.m. to 5 p.m. Call 661-822-6062 or visit galleryngifts.org for more information. For those interested in picking up the guitar again or trying out the drums, Lee’s House of Music is your one-stop shop. Lee’s also offers tune-ups, string replacement and lessons. The music store is open from 1 to 6 p.m. Tuesdays through Fridays, 1 to 5 p.m. on Saturday and is closed on Monday and Sunday. Visit Lee’s House of Music at 20407 Brian Way, Suite 3, and you can call 661-822-0459 for more information. Have you wanted to learn how to play guitar but just didn’t know where to start? Bri Brubaker has teamed up with the Tehachapi Valley Recreation & Park District to supply Tehachapi with music lessons. Private lessons are open to all ages and are $30 per class. Brubaker teaches guitar and ukulele and even has group lessons at her studio, 20725 South St. Suite 7. For more information, call her at 661-557-7341, email her at bribrubakermusic@gmail.com or visit www.musicbri.com. To catch the latest movies on the big screen, the Hitching Post Theatres is the spot. The multiscreen complex is on the corner of Green and F streets. While you’re watching your movie, snack on some frozen cheesecake on a stick, a Hitching Post Theatre classic. For more information, call 661-823-7469 or visit hitchingposttheatres.com. If concerts aren’t your thing, Movies in the Park will allow you to spread a blanket on the grass of Philip Marx Central, Brite Lake and Meadowbrook parks and enjoy the summer weather. Every Thursday evening, during the summer, enjoy movies played on an 26-foot inflatable screen with theatrical sound. If you’re feeling hungry, the Tehachapi Valley Recreation & Park District supplies a concessions stand for the viewings. For more information or an entertainment schedule, call 661-822-3228.